The Palestine Maritime Lloyd Co. Ltd. The Har Zion and its sister ship the Har Carmel were owned by the Palestine Maritime Lloyd shipping company, formed in 1934. 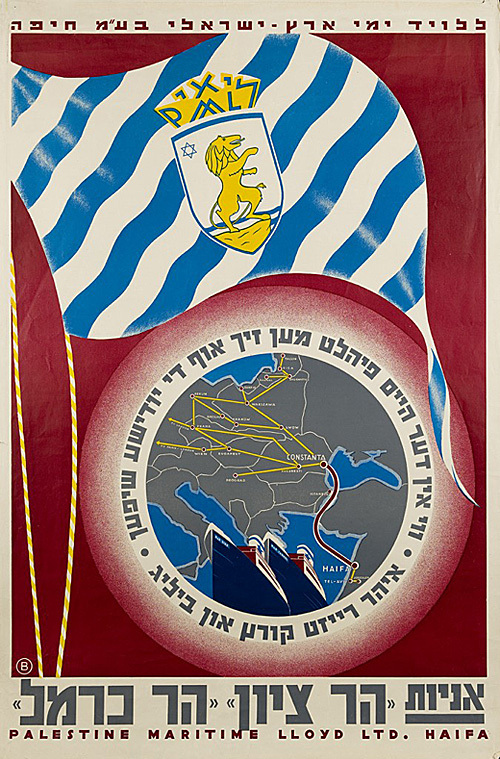 The company and its ships were Jewish-owned, operated under Zionist principles, and flew under the “Jewish” flag. Translation from Hebrew: Palestine Maritime Lloyd LTD, Haifa. Ships: Mt. Zion, Mt. Carmel. Translation from Yiddish: Your journey will be quick and inexpensive while you feel at home on the Jewish ships.